Selected as Forces War Records' Book of the Month for May 2017. As featured by The Sun, Daily Mirror, Mail Online and the Express. Click the links to read the articles online. You'll be £19.99 closer to your next £10.00 credit when you purchase Best Foot Forward. What's this? In the whole of the Second World War, only two men succeeded as operational fighter pilots in the RAF after losing both legs. Douglas Bader was one, and his story is well-known indeed, he has been described as one of the Royal Air Force's most famous pilots. The other was Colin Hodgkinson. Colin was injured in a flying accident whilst training with the Fleet Air Arm in 1939. He awoke in hospital to find that his right leg had been amputated at the thigh, whilst his left leg was severely injured. His face was also damaged and he had trouble with the sight in one eye. In the weeks that followed, Colin's remaining leg refused to heal. Coolly, calculatingly, he made his decision: Chop the damned thing off and lets be done with it. A true biography of a war hero that fought many battles with the enemy in the air and with himself. The book is a hardcover with 223 pages, a nice cover and 16 pages of original black and white photos. Strongly recommended if you want to learn more about how to become a true hero despite many setbacks and even without your legs. Bader, who scored 22 aerial victories despite having lost both legs, remains a household name. But Flt Lt Hodgkinson’s exploits have been largely forgotten – until now. 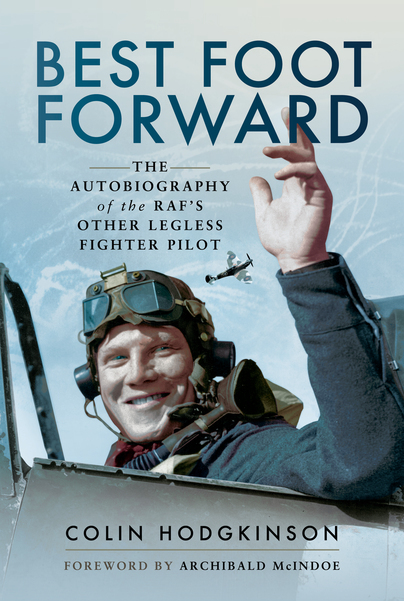 Immediately after the war, he penned an extraordinary autobiography, which has been republished by historian Mark Hillier as new book Best Foot Forward, 60 years after it was first written. The remarkable story of a pilot who lost his legs in a horrifying crash then went on to become a celebrated World War Two flying ace has finally been revealed, 20 years after his death. THE REMARKABLE story of a World War Two pilot who became a Spitfire hero despite having both his legs amputated has come to light.